Participants should receive individual shooting instruction, ideally provided by their mentor/guide. The ideal situation is to initiate participants into shooting with an air gun, so they can develop some basic shooting skills prior to shooting a high-powered rifle or shotgun slugs. Small-bore rifles (.22s) can be used as an alternative introductory experience, or as part of a progression leading up to the shooting of high-powered rifles or shotgun slugs. It is much easier to teach and learn fundamental shooting skills when the student is not having to manage recoil at the same time. Federal Premium Ammunition offers an excellent resource to review shooting instruction. 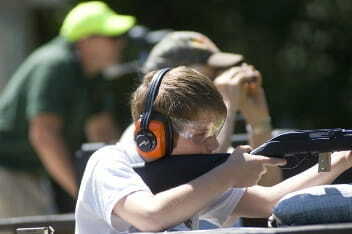 In most situations, a participant’s first few shots will be taken from a bench rest. This is a great way to build confidence in their shooting skills. Once the basic skills are reasonably mastered, we recommend that participants be allowed to shoot using other shooting positions, if the range rules permit shooting from different positions. Of particular importance are positions more likely to be used while hunting, such as using shooting sticks or a pack for a rest. It is highly recommended that your firearm training practices mirror those taught in your state-sponsored hunter education programs. While your program likely goes well beyond what is taught in a standard hunter education class, it is important that the training practices be similar. Because many of your participants are interested in hunting because it provides a source of food, we recommend that you be prepared to discuss the pros and cons of using non-lead ammunition for hunting during the “matching firearm to ammunition” presentation. Because the use of non-lead ammunition for hunting is a personal choice in most states, this topic lends itself to becoming a homework assignment or a topic for small group discussion. There are so many skills that go into hunting. But marksmanship is one that can truly make or break a hunt.